his beatification. The tombstone reads, "Oh our Lady, you are the security of our hope." I have been thinking in these days of writing more of the story of the impact that Msgr. Luigi Giussani had (and continues to have) on my life. What he gave me has remained a focus for my life, a vocational commitment, and also the source of a suffering that I have been willing to endure, and -- at times -- even embrace. But tonight, recalling the tenth anniversary of his funeral, I desire only to represent the compelling words I posted last year, along with the picture of his simple tomb. In an era of so much celebrity worship and personality cult (even in the Church), Don Giussani was something remarkable: he was the real deal. He still is. I'm not the only one who thinks so. 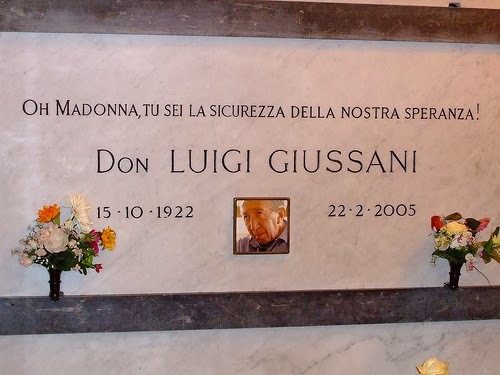 The municipality of Milan has had to move Giussani's tomb to a more accessible place in the city cemetery to accommodate the crowds of pilgrims. And I remember the man, the teacher, speaking with such passion in the years when he was still full of physical vitality, surrounded by a pile of dog-eared books on the desk and a bottle of mineral water. "This is the ultimate embrace of the Mystery, against which man–even the most distant, the most perverse or the most obscured, the most in the dark–cannot oppose anything, can make no objection. He can abandon it, but in so doing he abandons himself and his own good. The Mystery as mercy remains the last word even on all the awful possibilities of history. "For this reason existence expresses itself, as ultimate ideal, in begging. The real protagonist of history is the beggar: Christ who begs for man’s heart, and man’s heart that begs for Christ."